The resignation of the founder of UPB Holding Uldis Pilens from the position of the Chair of Board and handing over of the reins to the next generation nursed within the company has provoked a strong response in the city this week. In search for reasons, various guesses and versions have been stated. The attention paid is even greater because also U. Pilens companion Mr Oskars Mors has left the Board of the company. Placing U. Pilens in the limelight this week, we dare guessing that this could be his next long-range strategy — to keep the finger on Holding’s pulse from the position of Chair of the Council. “At fifteen my heart was set on learning; at thirty I stood firm; at forty I had no more doubts; at fifty I knew the mandate of heaven; at sixty my ear was obedient; at seventy I could follow my heart’s desire without transgressing the norm,” U. Pilens likes quoting this saying by Confucius, when asked about his philosophy of life. Guided by this formula, U. Pilens approaches the threshold of understanding the mandate of heaven and is getting ready for obeying. But perhaps the reason is rather pragmatic just like in the laconic communication released by the company this week and informing that being at the top point of its current development the Holding has decided to re-group its management by engaging an active and energetic generation of young managers in the operative business management, as this would allow the Council, led by U. Pilens, concentrate on the future development strategy of UPB Holding more intensively. Looking back on his business activities, U. Pilens concludes that he has not made any dramatic mistakes. Indeed, the growth of the company cherished by the former young architect is remarkable. Having started off as a small architect’s office in the provinces with just some employees 24 years ago, it has now turned into an industrial concern with daughter companies located not only in Latvia but throughout whole Europe and providing 1400 jobs. And its biggest shareholder is now included in various lists of Latvian millionaires. Of course, not everything has gone on swimmingly, there have been also ups and downs. Sometimes U. Pilens has been reproached for conflict of interests, but he has always rejected them and stressing that he likes to play with his cards open. Just like any other successful businessman U. Pilens has never lacked neither supporters and believers nor enviers and faultfinders. Therefore there is no wonder that a number of speculations have arisen over his change of offices. Mischievous tongues try comparing U. Pilens with the rich brick manufacturer Ceplis who deserted the sinking company and handed it over to a young and inexperienced manager. There are some people wondering if this situation is related to the recent changes in laws providing that members of board will have to repay company’s tax debts. But these envious gossips fall to pieces like last year’s leaves when hitting against the Pilens rock-hard calmness and absolutely positive performance results of the company. “He embodies a kind of Olympic peace. I have never heard Uldis raising his voice or seen him nervous, emotional. I think it is important for a man who wants to reach high goals and good result,” the former Member of Parliament Mr Janis Lagzdins characterises U. Pilens. Lagzdins and Pilens can be regarded as the godfathers of the former Liepaja Joint List, the core of which later turned into the political party “Liepajas partija” (Liepaja Party). U. Pilens was then called the main strategist and ideologist of Liepaja Joint List, one of the most powerful people in the city and, in lobbies, even the neck turning the head. 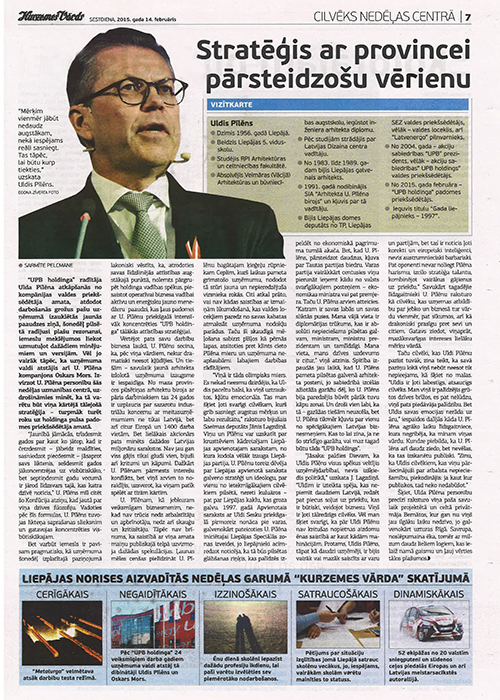 In 1997, the Joint List led by Mr Uldis Sesks first won the election, mainly thanks to the establishment of Liepaja Special Economic Zone initiated by U. Pilens. Obviously, people of Liepaja believed that it would be the city’s lifebuoy helping to swim out of the dark water-hole of economic decline. But when U. Pilens, to a surprise for many, joined the People’s Party, the ruling party repeatedly tried talking him into taking some of the most important offices in the State — the position of Minister of Economics or even of the Prime Minister. But U. Pilens has always refused these opportunities. “Each has their strong and weak points. My weak point is the lack of diplomacy, which is absolutely necessary for a head of city, minister, prime minister and so on. My place, my task of life lies somewhere else,” he admits. It was easy to observe U. Pilens spitefulness when he left the position of Liepaja main architect due to a public uproar regarding garages that U. Pilens had planned to construct too close to the dune zone. And it seems that everything turned out as it should have — garages were not built after all and U. Pilens has meanwhile become one of the most powerful Latvian businessmen. Who knows, would there be such UPB Holding if not for these controversial garages. “I have to say thank goodness for Uldis Pilens putting all effort to business and not wasting them in politics,” says J. Lagzdins. 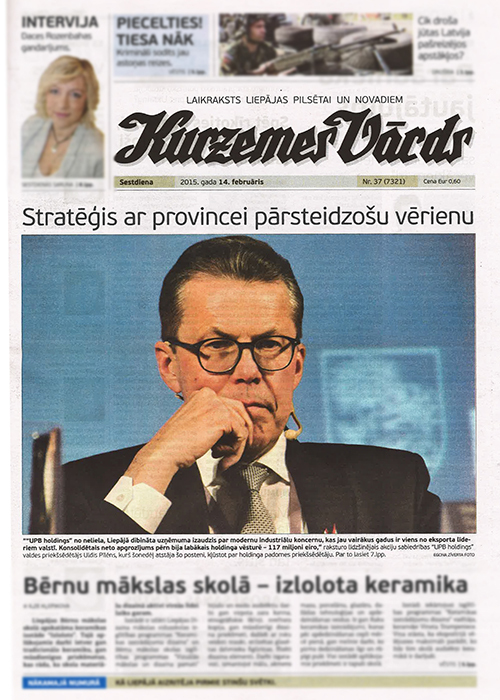 “Uldis has a remarkable power not possessed by many in Latvia — to think even five steps ahead, which is high value in doing business. He is a very far-sighted man. In addition, I find it important that no serious shadow of suspicion regarding any machinations has been cast over Uldis Pilens. Of course, Uldis Pilens just like many other entrepreneurs has been linked with the power and parties more or less, but it has happened in a correct and European-intelligent way avoiding the Eastern barbarian methods. Even opponents cannot deny Pilens charisma and the outstanding talent of strategist when combining several moves ahead.” But the current peers describe U. Pilens as a person who takes responsibility for anything and always keeps his word in business, even in trivia, and a one who is extremely demanding for himself and others. He is ready to sacrifice the less important, to his mind, interests for biggest causes. It seems that the personality of Uldis Pilens is precisely characterised by the private house designed and build by him in Bernati, although he does not live there anymore and resides mostly in Riga. This house is a solitary, mysterious building but with many large windows letting the light in and allowing gazing in the far.